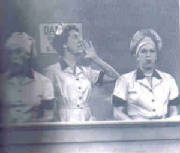 This is a page devoted to the very best episodes of I LOVE LUCY. Enjoy the write-ups of these classic episodes. More will be posted shortly! THE SÉANCE. Lucy and Ethel become obsessed with numerology, leading to a mix up between Ricky and a man, Mr. Weatherby (Jay Novello), who wants to hire him for a show. Luckily, Weatherby is also into horoscopes, numbers and the like, and Lucy decides to hold an impromptu séance to impress him; Weatherby hopes to get in touch with his beloved Tilly. 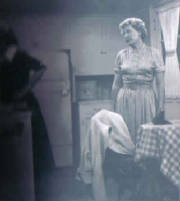 Ethel impersonates a medium, Madame Mertzola, and tries to make contact with the dead. [“Ethel to Tilly. Come in – Tilly.”] Lucy decides to portray the ghostly voice of Tilly, but who is doing the voice of an additional spirit? A silly, but highly amusing episode featuring a stand-out performance by the talented and versatile Jay Novello as the delightfully weird and neurotic Mr. Weatherby. THE FREEZER. Lucy and Ethel decide to save money by buying an old walk-in freezer from Ethel's uncle, but make the mistake of ordering two sides of beef to put in it. When 700 pounds of meat arrive in Lucy's kitchen, the girls decide to try and sell it off at the local butcher shop. Putting the meat and a scale in a baby carriage, the gals manage to sell only a couple of items before the angry butcher gets wise. When Fred and Ricky come home, Lucy rushes to move the 700 pounds of beef out of the freezer and into a hiding place and winds up as frozen as a Popsicle. Despite its absurdities, this is a clever and amusing episode with a good idea, expert execution, and a very funny finale. LUCY DOES A COMMERCIAL. Lucy is dying to be the girl who does the commercial on Ricky's TV show, but Ricky is just as adamant that it should be left up to a professional. Lucy, of course, winds up doing the commercial anyway but as usual there's a monumental foul up. 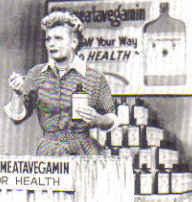 It seems that the product Lucky is hawking – VitaMeataVegaMin – contains 23% alcohol! 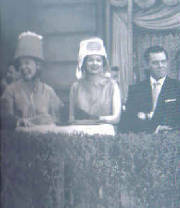 After rehearsing several times and taking a big swallow each time, Lucy ends up snookered and in no condition to do the show. This is classic Lucy with Lucille Ball firmly in center stage doing one of her most priceless bits and clearly exhibiting her own brand of comic genius. 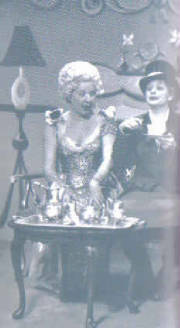 THE OPERETTA. Lucy has depleted the club treasury by borrowing from it to replenish her household expense account. This couldn't have come at a worse time, as the club plans to use the money to rent costumes and scenery for an operetta they are mounting. Lucy thinks she has solved the problem by issuing a post-dated check, but, as usual, nothing works out exactly the way Lucy expects it will. 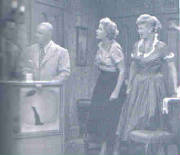 This is an absolutely wonderful Lucy episode with the cast showing off their musical comedy gifts; Vivian Vance is particularly delightful as “Lily of the Valley.” [She sings: “A girl's supposed to wait for a prince to come and get her; the only prince I ever met is a neighbor's Irish setter.”] In general the song lyrics are very amusing and clever [when they're not being deliberately inane] and the melodies are so lilting, especially for Ricky's love song to Lily, that many viewers actually thought they were composed by Victor Herbert [they are really tuneful Herbert pastiche.] 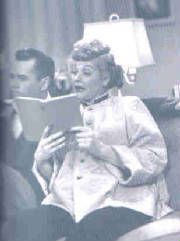 Lucy plays Camille, “the snaggle-toothed queen of the gypsies,” who is never allowed to sing by herself because, as Ricky puts it, “Lucy hits a flat none once in a while.” The Operetta ranks among the top five – if not the top two – I Love Lucy episodes. JOB SWITCHING. Lucy and Ricky and Fred and Ethel decide to switch jobs for one week, with the boys doing the cooking and housework, and the girls going out and getting jobs. After a near-disastrous interview at an employment agency, they manage to find employment at Kramer's Candy Kitchen. Fred and Ricky make a disastrous dinner including a seven level cake as flat as a pancake and four pounds of rice, while the girls are schlepped around from one candy department to another. There are at least two classic sequences in this amazing episode: Lucy getting into a slap-fest with another candy dipper because of a pesky fly; and the absolutely hilarious bit with Lucy and Ethel desperately trying to wrap pieces of candy that fly past them on a conveyor belt. [Somehow it doesn't matter that it's a little fantastical.] Alvin Hurwitz is perfection as Mr. Snodgrass, the exasperated man at the employment agency; and Elvia Allman is a riot as the stern forewoman at the candy factory. “There is no room in this plant for levity,” she tells Lucy, “however weak.” This is one of the funniest and most clever episodes of I Love Lucy. THE COURTROOM. The Ricardos buy a TV set for the Mertzes on the latter's 25th wedding anniversary, but trouble ensues when they try out the set and can't get a clear enough picture. Ricky, convinced that he knows all about television sets, attempts to fix the problem by connecting two loose wires with the result that the set blows up! An infuriated Fred then rushes up to the Ricardos apartment to smash their set! The two couples wind up suing each other in court and spout more sheer lies than the litigants on a dozen episodes of Judge Judy. When Ethel lifts her skirts to show off her legs for the Judge the way Lucy did, Fred snarls “wadda ya want to do? Lose us the case!” Harry Bartell is very amusing and right on the money as a process server who pretends to be a fawning fan of Ricky's. Moroni Olsen is the Judge, who also thinks he knows “a thing or two about television sets.” A funny episode with the four in top form. THE BLACK EYE. A comedy of errors that centers on the notion that nobody ever believes the real story behind a black eye, preferring something much juicier instead. Lucy and Ricky both want to read the same book – a gruesome mystery story – so they compromise, with Lucy reading it out loud. Later, Ricky throws the book to Lucy to put away, and accidentally hits her in the eye with it. 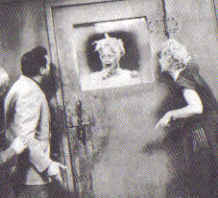 Fred and Ethel, seeing Lucy's black eye, and having heard Lucy espousing certain dialogue from the novel, wrongly assume that Ricky hit his wife. Nothing the younger couple can say will dissuade them from this opinion. Hoping to help smooth things over, Fred sends Lucy a batch of flowers in Ricky's stead – but inadvertently puts his own name on the card! This leads to such complications as Ethel thinking that Fred is Lucy's “mystery lover!” And soon everyone in the cast is sporting a black eye. An excellent example of a Lucy episode in which the humor comes almost entirely from the lines and circumstances – and the expert acting – and not from more slapstick-style situations. RICKY AND FRED ARE TV FANS. Lucy and Ethel rebel when they're made “boxing widows”for the umpteenth time, but nothing can get Ricky and Fred away from the set on fight night and for the girls it's a losing battle. They decide to go out without telling them and make them worry, but the boys don't even realize they're gone. They are also blissfully unaware that their wives have been mistaken for two female desperadoes – Sticky Fingers Sal and Pickpocket Pearl -- who have been holding stick ups in the neighborhood. The two manage to get away from a cop named Jenkins (Allan Jenkins), but he catches up with them on the roof just as they're about to snip the cable to the Ricardo's TV set – or so they think. This funny episode of comical misadventures is bolstered by the casting of veteran character actor Allan Jenkins as the cop and Lucy regular Frank Nelson as the desk sergeant. 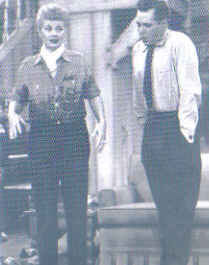 Nelson also played the talent scout Ben Benjamin in “Ricky's Movie Offer” and was Ralph Ramsey in several Connecticut episodes, among others. NEVER DO BUSINESS WITH FRIENDS. Mrs. Trumble (Elizabeth Patterson) can only shake her head in puzzlement at the childish antics of her neighbors the Ricardos and her landlords the Mertzes when the former sells the latter their old washing machine for thirty-five dollars. Almost immediately after the Mertzes take possession of the machine, it goes berserk, flinging wet laundry and spraying water all over the apartment. Fred and Ethel are convinced that Lucy and Ricky deliberately sold them a lemon, while the Ricardos think the machine now belongs to the Mertzes and is no longer their responsibility. The trouble is, Fred hasn't given Ricky the check yet – so whose washing machine is it? Do they wind up in court again? No. Mrs. Trumble's nephew lets it be known to both couples that he's willing to pay fifty dollars for the machine and each couple is suddenly eager to claim it. An interesting situation that is probably only slightly exaggerated becomes a laugh-fest under the Lucy casts' expertise. NOTE: reviews of season three and more season four episodes will be posted soon. ETHEL'S HOME TOWN. A new side of Ethel comes to light in an episode that delightfully highlights the talents of Vivian Vance, who is superb. 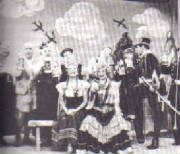 The foursome arrive in Albuquerque, New Mexico where Ethel is thrilled to see her father, Will Potter (Irving Bacon), who runs a soda shoppe. It seems that in her letters Ethel, a former vaudevillian who apparently still longs for the spotlight, has made it seem as if she's going to Hollywood to star in a picture instead of Ricky. Her father, old flame Billy Hackett (Chick Chandler) who runs the newspaper, and the whole town go all out for Ethel, who agrees to perform in a show for her fans. When she egotistically cuts her husband and friends out of the show, the trio decide to back her up anyway – on the stage! 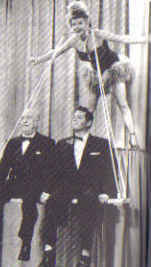 As Ethel sings such numbers as “My Hero” from The Chocolate Soldier, Lucy, Fred and Ricky – unbeknownst to Ethel – perform comedy routines behind her to the delight of the audience. Along with “Ethel's Birthday,” this episode is a particular favorite for Ethel Mertz/Vivian Vance fans. Vance's reciting of “my story” to newspaperman Hackett as the others look on aghast is a pip! Bacon is also marvelous as Ethel's father. NOTE; In this episode “Ethel Roberta” becomes “Ethel Mae” Potter. LUCY GETS IN PICTURES. Lucy has told all her friends that she's going to be in a movie and is desperate to get into a picture. 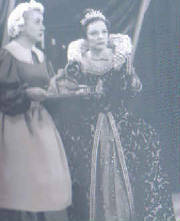 [Although Marian Strong remains Marian Strong, old friend and enemy Carolyn – or Caroline -- Appleby becomes Lillian Appleby in this episode -- but only for this episode.] 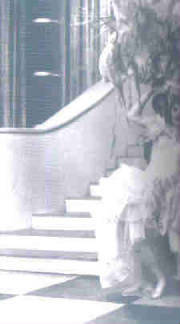 Lucy's desperation becomes depression when she learns that the Metrzes – and even the bellboy – have gotten parts in pictures. Lucy sits at Schwab's drug store eating Sundaes and drinking sodas until she turns green, hoping to be discovered a la Lana Turner. Finally Ricky arranges for a director acquaintance, Frank Williams (Lou Krugman), to give her a small part in a movie. Lucy is to play a lead chorus girl who is shot as she sashays down a stairs, but the huge headdress she has to wear proves hilariously unmanageable and Lucy has to be replaced – although she still has something up her sleeve. A sidesplitting Lucy episode bolstered by great support from Lou Krugman. RICKY SELLS THE CAR. We're hilariously reintroduced to the petulant, crabby Ethel Mertz in this winning episode, which pretty much wraps up the foursome's adventures in Hollywood. Ricky decides to take a good offer for his Pontiac, figuring it will be cheaper for them to take the train back to New York. Unfortunately, he forgets to get tickets for the Mertzes. 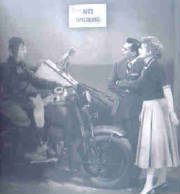 This leads to a comical series of mishaps in which Fred and Ethel attempt to motorcycle their way back to Manhattan – with disastrous results -- and Ethel practically accuses Lucy of “coming on” to Fred! [Yes, Fred!] Ironically, it's Ethel who kisses Ricky after he forgives the temperamental Fred and buys the tickets. Lucy gets in dutch when she has to figure out a way to switch tickets with the Mertzes after she and Ricky wind up with the upper berths meant for Fred and Ethel. LUCY WANTS A PARIS GOWN. While in Paris Lucy decides that she's just got to have a Jacques Marcel Original after attending his exclusive fashion show, and [allegedly] goes on a hunger strike because Ricky refuses to buy her one. Ricky eventually gives in, but when he finds a chicken hidden in a camera case realizes that he's been duped and takes the dress back. Furthermore, he decides to get even with Lucy by having a tailor make a fake “Jacques Marcel” dress out of a potato sack. Fred decides to give a “Jacques Marcel” Original to Ethel, too. The girls look really hilarious walking around in these fake burlap dresses [Lucy has a horse's feedbag as a hat!] which aren't that much worse than Marcel's actual designs. Marcel, of course, sees Lucy and Ethel in all their glory at an outdoor cafe, and promptly steals the designs! A very funny episode in which Ricky at last pays Lucy back and then some. LUCY MAKES AN ITALIAN MOVIE. 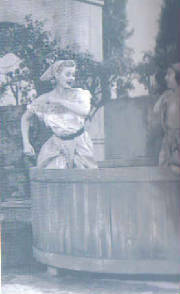 While traveling to Rome by train, Lucy is spotted by famous director Vittorio Felipe, who wants to use her in his latest movie Bitter Grapes. Lucy thinks the film is about the wine industry and winds up in Turo, where they still make wine “the old-fashioned way” -- by getting in a vat and stomping the grapes with their feet. The manager sees that Lucy has feet “the size of pizzas” and puts her in the vat, where, exhausted, she slacks off for a moment and gets into a hilarious, messy cat fight with the feisty Italian lady with whom she's sharing the vat. This is a clever, highly amusing, and Lucy episode with one of the show's most memorable and unusual set pieces. The two ladies really throw themselves into the ring – so to speak! A very funny coda involving Felipe, an excited Ethel, and a very jealous Lucy. LUCY DOES THE TANGO. This is the second half of a two-parter that begins with Lucy Raises Chickens. Fred and Ricky have decided to go into business together raising chickens. Fred will look after the birds in exchange for free room and board for himself and Ethel, who have decided to move to the country. But Fred has made a major mistake. He thought the 500 chicks they bought would begin laying eggs in six weeks – instead it's six months! They exchange the chicks for full grown chickens, but the birds don't seem that eager to deliver the goods. Lucy comes up with a scheme to plant store-bought eggs under each chicken and buy them a “little time” before Ricky decides to give up the egg-selling scheme for good. Hiding eggs under her clothes, Lucy is surprised by Ricky who wants them to rehearse their tango act for the PTA show right now – leading to the longest single laugh in the history of I Love Lucy. COUNTRY CLUB DANCE. In an episode that is somewhat reminiscent of “The Charm School,” the gals have to drag the fellows to a country club dance and become incensed when the grumbling guys perk up at the appearance of the Munsons' house guest, the lovely – and young -- Diana Jordan (Barbara Eden). The ladies decide to give themselves the glamor treatment so that their husbands will pay more attention to them. As Lucy puts it, “glamor today is nothing but tight skirts, loose hips, and wet lips.” Lucy looks quite gorgeous in this episode, but her plan backfires when she allows her suspicious nature to get the better of her, leading to a walk-out from a second dance and the blatant ire of her gal pals. A very amusing episode. LUCY-DESI COMEDY HOUR. The Celebrity Next Door. Guest-star: Tallulah Bankhead. Lucy and Ethel are agog over the arrival of a new Connecticut resident who turns out to be star of stage and screen Tallulah Bankhead, playing herself. She first gets in touch with Lucy because she hopes she can help her find “a couple,” i.e. a man and woman to serve as maid and butler. Embarassed that she herself doesn't have “a couple,” Lucy blackmails Ethel and pays Fred into playing servants the night Tallulah is invited to dinner. The dinner party is a disaster, but Tallulah agrees to go to a PTA [“PT what?” asks Tallulah] meeting with Lucy to give pointers for the musical they're planning to put on. Lucy isn't thrilled when Tallulah convinces everyone to do a dramatic play instead, but Tallulah asks the Ricardos and Mertzes to appear with her in the play. After a misadventure with a paint sprayer and some freshly painted chairs, Tallulah and Lucy nearly come to blows, with Lucy vowing to make Tallulah pay dearly for her treatment of her. The night of the play Lucy tries to keep Tallulah off the stage entirely, but when that fails, she surreptitiously feeds her strawberries giving her hives. Although the play is ruined, everyone thinks it was a comedy and a raving success, prompting the PTA to ask Lucy and Tallulah and the others to do it -- what Tallulah refers to as “this clambake” --all over again the following night. 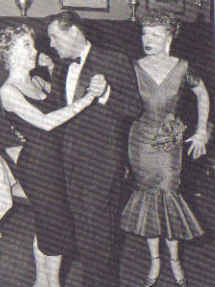 Tallulah astonishes Lucy by agreeing to do the show: “You have no idea what I would do to get a laugh,” she tells her. Bolstered by a superb comedy performance by Bankhead, with Lucy and the gang at the top of their game, this is the best of the hour-long shows and one of the most memorable episodes in the long run of I Love Lucy. Lucy and Tallulah work great together and there are many hilarious sequences. Stay tuned! 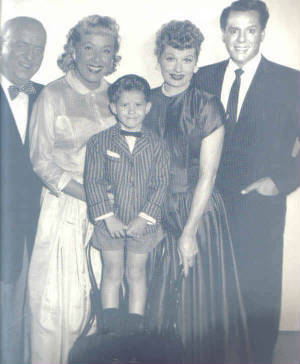 More on I LOVE LUCY and other classic sitcoms to come! Note: Press "Home" on your keyboard to go straight back to the top.